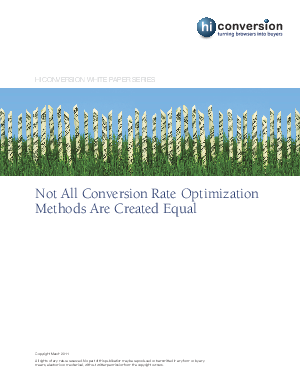 White Paper Published By: HiConversion, Inc. Selecting the right conversion rate optimization method is the single most important factor in determining the success of your e-commerce optimization initiatives. The goal of this white paper is to help you better understand options, limitations, and risks as associated with the various methods employed in attempting to increase e-commerce conversion rates. Contained in the 14-page document is a detailed comparison of competing methods such as A|B testing, multivariate testing, targeting and optimization. If you are an e-commerce merchant considering conversion rate optimization for the first time or a testing veteran looking to switch to a more effective CRO solution, this white paper represents the perfect starting point.